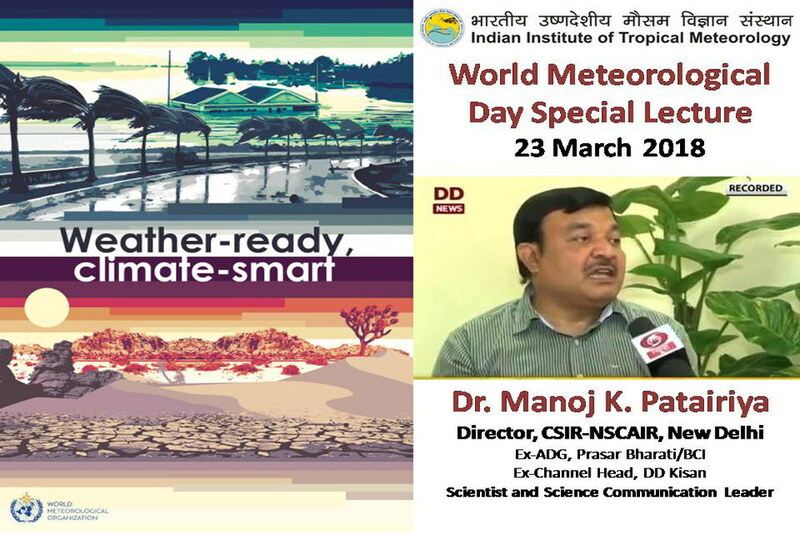 IITM celebrated the World Meteorological Day by organising a Special Lecture on the theme “Weather-ready, Climate-smart” by Dr. Manoj K. Patairiya, Director, CSIR-NISCAIR, New Delhi. Through his lecture, Dr. Patairiya emphasized on how science communication can play an active role in establishing better linkages between science and society for making us weather ready and climate-smart. The ever-growing global population faces a wide range of hazards such as tropical cyclone storm surges, heavy rains, heatwaves, droughts and many more. Long-term climate change is increasing the intensity and frequency of extreme weather and climate events and causing sea level rise and ocean acidification. Urbanization and the spread of megacities means that more of us are exposed and vulnerable. Now more than ever, we need to be weather-ready, climate-smart and water-wise. This is why one of the top priorities of WMO and National Meteorological and Hydrological Services (NMHSs) is to protect lives, livelihoods and property from the risks related to weather, climate and water events. Thereby, WMO and its Members support the global agenda on sustainable development, climate change adaptation and disaster risk reduction. WMO and National Meteorological Services design operational services ranging from daily weather forecasts to long-term climate predictions that help society to be weather-ready and climate-smart. Further National Hydrological Services are essential for the sound management of fresh water resources for agriculture, industry, energy and human consumption, so that we can be water-wise. These services empower us to manage the risks and seize opportunities related to weather, climate and water. Early warning systems and other disaster risk reduction measures are vital for boosting the resilience of our communities. Climate services can inform decisions on both climate change mitigation and adaptation. Hydrological monitoring increases our understanding of the water cycle and so supports water management. Dr. Manoj K. Patairiya said that concerted efforts should be made to take the benefits of research on weather and climate to the masses. Extreme weather events are increasingly becoming a threat and danger to life and property. Here, scientific awareness about such events can help us to safeguard and minimize loss of our life and property. To tackle the risk of changing weather and climate patterns, we not only need better forecast and warming systems, we also need a strong coordination among different communities and stakeholders. Especially, the media and press need to play an active role in disseminating weather and climate messages to the general public. We can become weather-ready and climate-smart only when the knowledge is communicated to the end users so that they can take appropriate actions for mitigating the risks of weather and climate. Dr. Patairiya, who was earlier ADG of Prasar Bharati and Channel Head of DD Kisan, informed that DD Kisan provides 3-4 weather bulletins daily. Consultations with farmers revealed that smart farmers are regularly using this weather information and are getting benefitted, he added. “Not only TV, we need to use all possible media in a coordinated way to benefit our farmers from the advances and forecasts of weather and climate,” said Dr. Patairiya. While sharing the experience of VACCIN project which NISCAIR is executing along with 10 other institutions, Dr. Patairiya presented a brilliant case study of how concerted and coordinated efforts for communicating scientific knowledge and technological interventions have benefited people from extremely weather sensitive areas like Lakshadweep Islands, Sundarbans and certain Himalayan regions. He emphasized that such efforts to spread scientific awareness and making technological interventions available for public use can only prepare us to face the challenges of changing weather and climate. 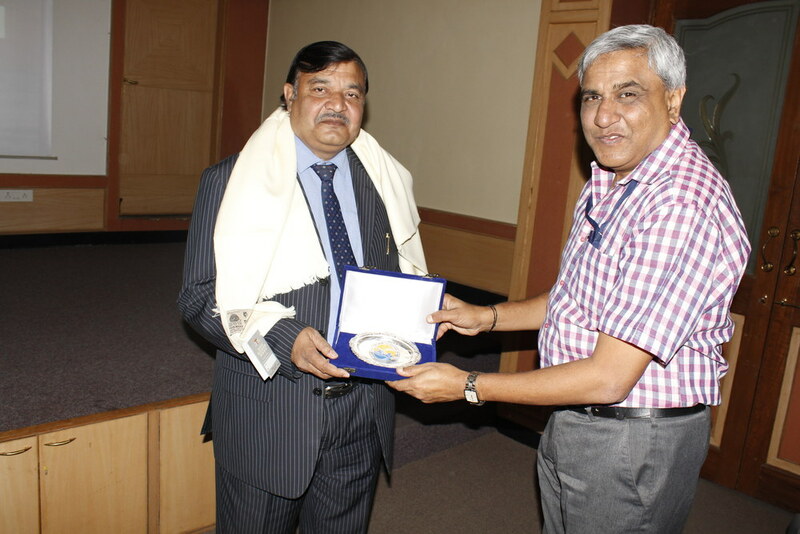 Felicitating Dr. Patairiya, IITM Director Dr. Ravi S. Nanjundiah presented him an IITM memento. The programme was conducted and coordinated by Shri Abhay SD Rajput, scientist at IITM.